Cut-away view of the Model 660-“Classic” HD with Cambridge Scale Works pit form . Top access to junction box and leveling feet adjustments make the 660-“Classic” HD the ideal scale for in-floor installations. 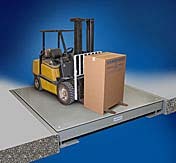 The cross strutted tubular steel construction and 1/2 inch thick steel deck plate make this scale capable of handling extreme traffic and heavy loads with ease. 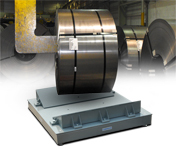 Our 660 series now includes our 660-Coil Series Concentrated Load Scale. Built for the punishing task of weighing concentated loads and perfect for applications such as Steel Coils, Aluminum Coils, Copper Coils, Cable Spools, Billets, Charge Weighing, Castings. Self checking captive ball leveling feet work together with a super heavy duty frame work to create a scale with the strenght to handle whatever you can throw at it.